According to SpaFinder’s list of the Top Global Trends for 2012, color therapy is gaining momentum as more spas incorporate Ayurvedic medicine, an approach that conceives of the body in terms of seven chakras, each associated with a specific organ, and each, in turn, associated with a color. In Ayurvedic thinking, physical imbalances can be improved via color therapy. 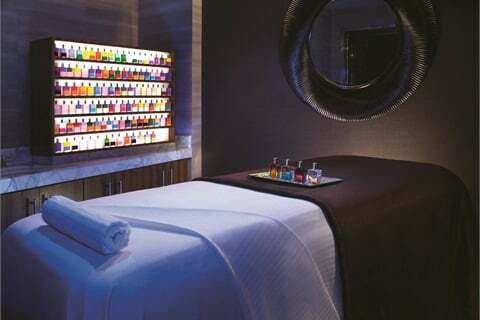 Qua Baths and Spa at Caesars Palace in Las Vegas is one of the first spas in the country to offer Aura-Soma therapy, a combination of massage and aromatherapy with the natural healing powers of color and light. Two treatments — Aura-Soma Synergy (135 minutes; $400) and Aura-Soma Color Quest (75 minutes; $210) — are designed to bring balance and support to both the client’s physical and emotional well-being, leading to enhanced awareness and self-discovery. The treatments feature 109 beautiful Equilibrium bottles filled with colors, aromas, crystals, and light. These blends contain 100% organic essential oils, herbs, and flower essences. Treatments begin with the client’s selection of duo-colored bottles and a consultation to explain the meaning of each color and how it applies to each area of the person’s life. Each color combination and the order in which it is selected symbolizes a different area of the individual’s life including personality, gifts and talents, present state, and potential. Clients choose one color to focus on throughout the treatment and that color is incorporated into a multi-sensory experience using sight, smell, and touch.